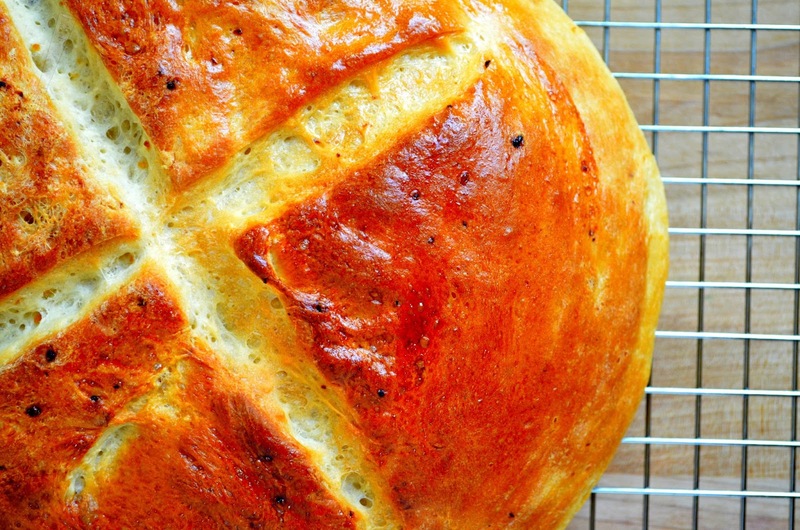 A warm and crusty loaf of garlic bread is one of my favorite foods to eat. 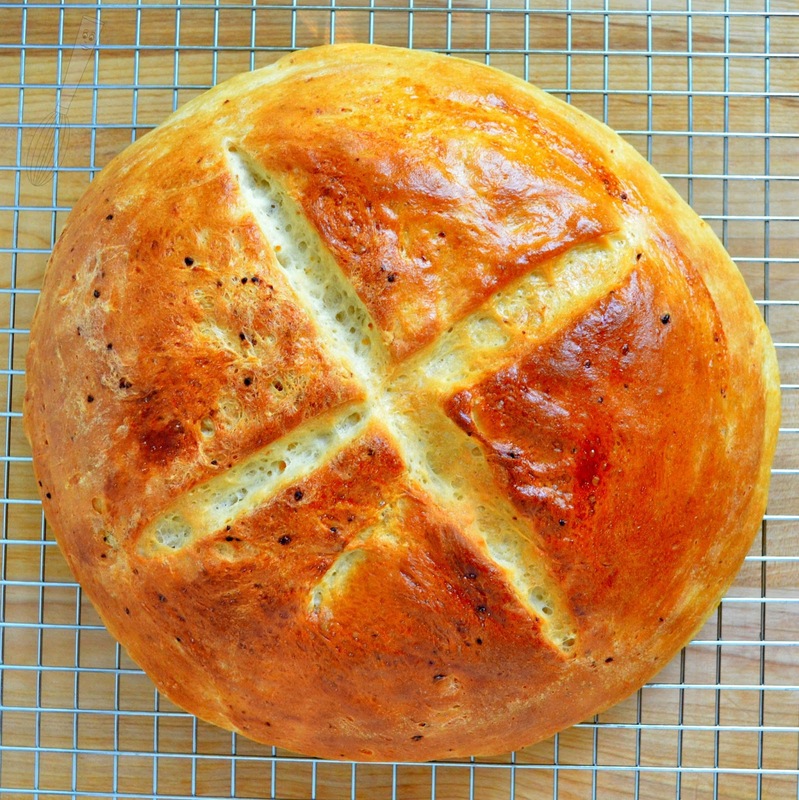 I believe that a really good loaf of bread doesn't necessarily need butter but could be enhanced by it. I also love lightly toasted bread with a bit of butter or just bread straight from the oven (I've burned myself more than a few times during the excitement of a loaf just out of the oven that smelled wonderful). 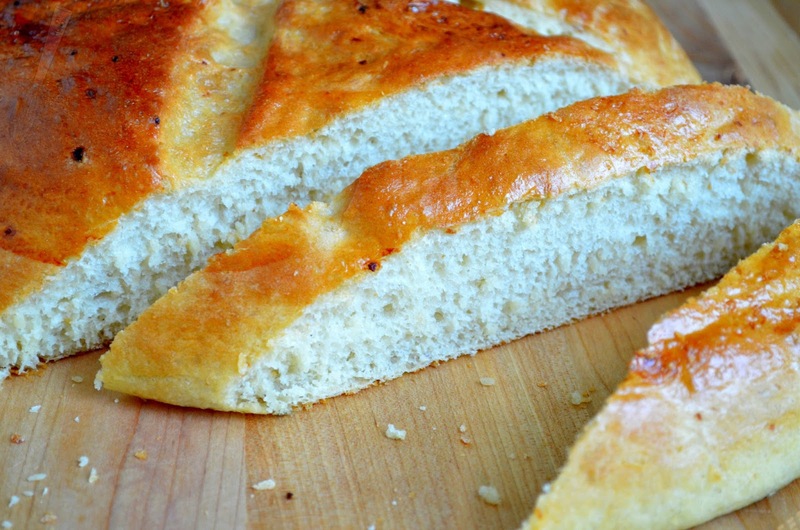 The garlic flavor in this bread comes from sauteed minced garlic. Another option would be to roast a head of garlic in the oven and squeeze tha resulting garlic paste into the bread when you would add the minced garlic. This bread doesn't provide an overwhelming garlic flavor so feel free to add more if you would like to. I may add some more next time. But I love this bread and it's crunchy crust and soft, fluffy inside. You can see the the little specks on the top of the bread, that's garlic, delicious garlic. You know those big jars of minced garlic in the stores produce section that most people look at them and say "who would buy that huge jar?!" me. I do. I love the stuff. I add it to almost everything. Breads, soups, stir-fries, spaghetti, everything. Which should explain why garlic bread is the bread I will pick every time when I have an option. Not the frozen garlic bread of course, like the kind with roasted whole garlic cloves, or this one with sauteed garlic. I hope you enjoy it as much as I do! 1. In a small skillet heat the garlic and olive oil over medium heat until the garlic is just starting to turn golden (do not let it cook too long or it will burn very quickly). Set aside. 2. In the bowl of a mixer stir together the sugar, yeast, and warm water, let sit for 2-3 minutes or until the yeast mixture is foamy. 3. Stir in the roasted garlic, bread flour, and salt. Knead for 5 minutes. Turn into a lightly greased bowl and cover with a kitchen towel or greased plastic wrap. Let rise for 35-40 minutes in a warm place until almost doubled. 4. 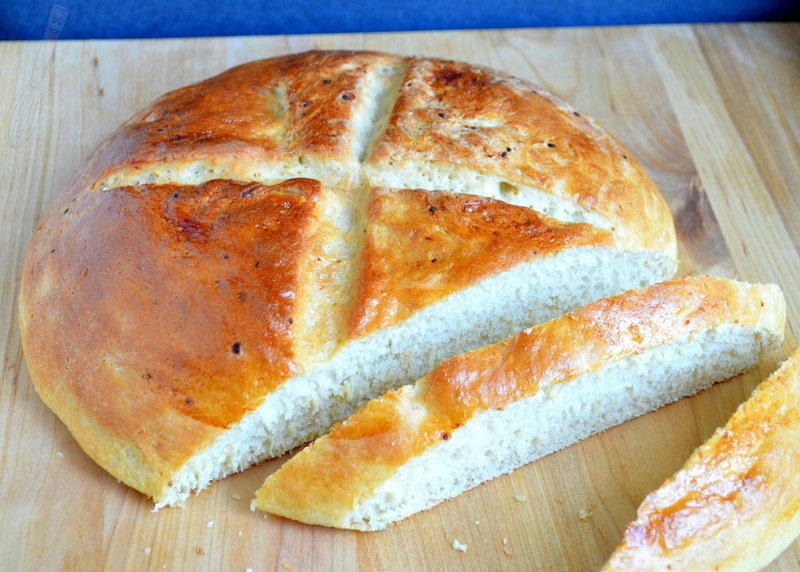 Punch down the dough and shape into a boule on the sheet pan. Cover with a kitchen towel (flouring the dough just a little if necessary so that the kitchen towel won’t stick or lightly greased plastic wrap. Let rise for 35-40 minutes or until almost doubled. Preheat the oven. 5. Lightly whisk the egg white in a small bowl. Brush the risen dough gently with the egg white, then bake for 30-35 minutes or until golden brown and it sounds hollow when you knock gently on the crust. Secret Recipe Club! Cheddar Cheese Apple Pie!